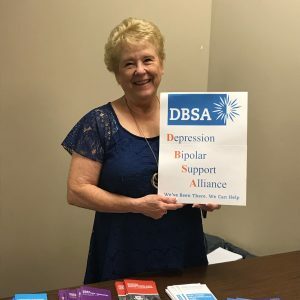 “Giving hope and acceptance to people.” These words reflect Marilyn Burdick’s sense of purpose in her 8-year involvement with the Depression and Bipolar Support Alliance (DBSA) at our church. In these years, Marilyn has seen “miracles” – people are getting jobs, having children, and just “living”. So how wide spread is DBSA? Did you know that the two most prevalent mental health conditions are depression and bipolar disorder? Did you know that these two disorders affect more than 21 million Americans, account for 90% of the nation’s suicides every year, and cost $23 billion in lost workdays and other workplace losses? In 2010, Marilyn witnessed many in our community suffering from mental health issues – all too often seeing suicides as the result of depression. She approached Pastor Christopher Carlton, one of our associate pastors, and asked what we could do about this situation. Christopher then told her about DBSA and how it is so impactful for many. Then, he challenged her by saying, “YOU can do something about it.” After investigating this organization and liking what she saw, Marilyn approached Christopher again and requested his help to get started. This conversation eight years ago led to the first DBSA meeting with 8-10 people attending. Today, JCUMC supports and provides a meeting place for adults 4 times each month for adults and 2 times each month for teens, young adults, and their parents. Now instead of 8-10 people, there are 25-30 people at every meeting. In addition, there are 300 people on the mailing list – ranging from regular meeting attenders to those who have expressed interest. This ministry is reaching so many. Marilyn’s passion and heart for this ministry is obvious as she shares more details. She smiles as she describes the meetings and those who attend. As Jesus charges us to go out into the world to minister to others, Marilyn explains that in this ministry we are reaching out to people – many who never go to church, adding that we need to support and accept them where they are. So, back to the nitty-gritty details about how this ministry works. The meetings are free and confidential. Trained volunteers facilitate the meetings, which begin with some housekeeping rules and regulations – #1 being confidentially. The meeting proceeds with individual check-ins and discussion. The typical two-hour time seems to fly by. In closing, each participant is asked to share something that another group member offered during the meeting that will personally help them over the next week. After these thoughts are shared and the meeting ends, everyone leaves with messages of hope on their minds. If you want to know more about this ministry or volunteer to help, please email . . . . . . .